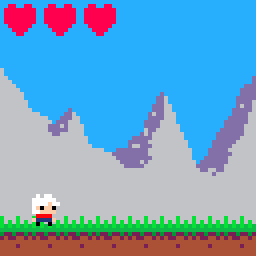 AN AVERAGE ADVENTURE is a game created for the #LOWREZJAM. All incredibly sub-par music, SFX, and sprites were created by me. Play as a young boy who must reclaim his stolen amulet from a wizard. But this won't be your ordinary run-of-the-mill adventure. Oh wait. Scratch that, yeah it will. Jump, die, stomp, die again, and run to the right in this decidedly ordinary adventure! This game can be played either using WASD and space or using a game pad. I plan to flesh this out a lot more after the jam. I feel like it has some potential.